The Heritage: a home for Regina’s seniors since 1972. Image: Google Maps, September 2016. 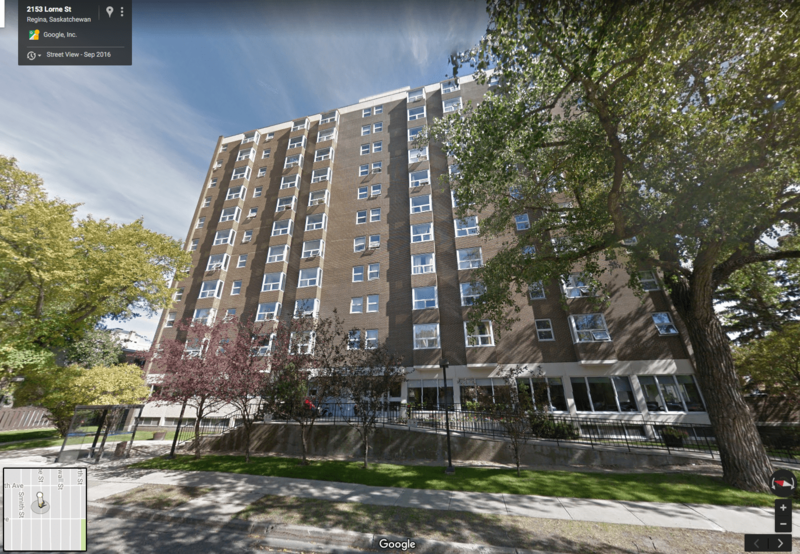 As I explore a bit in an upcoming piece about the MacLaren House nursing home (1967-1993) in Ottawa, shelter for seniors came to be a major concern in housing policy during the 1960s.1To be certain, it was a known issue long before that, but it was not until the 1960s in Canada that it received a dedicated policy response. I was recently flipping through some historic materials and came across some notes for a seniors’ apartment in Regina. The apartment, an 11-storey modern design of the CMHC’s David E. Crinion and B.R. dePourbaix, began construction in 1971. The 127-unit building was constructed by Poole Construction (PCL) and completed in 1972.2CMHC. Project Notes: Regina Senior Citizens Apartment (Ottawa: CMHC, October 1970); “Senior citizens’ block tenders to be called,” Regina Leader-Post, May 6, 1971, 3; CMHC, Urban Renewal and Low Income Housing 7, no. 3 (1971): 36. Operated by the Regina Housing Authority, the building continues to house seniors in a convenient location near the city’s core. 1. ↥ To be certain, it was a known issue long before that, but it was not until the 1960s in Canada that it received a dedicated policy response. 2. ↥ CMHC. Project Notes: Regina Senior Citizens Apartment (Ottawa: CMHC, October 1970); “Senior citizens’ block tenders to be called,” Regina Leader-Post, May 6, 1971, 3; CMHC, Urban Renewal and Low Income Housing 7, no. 3 (1971): 36.